Dubai’s real estate market logged a nearly 17% increase in transaction volume in the first six months of 2017 compared to the same period last year—driven by strong activity in posh neighborhoods like the Palm Jumeirah, Burj Khalifa and Dubai Marina. Real estate transactions, which the government defines as both property sales, mortgages generated and “other” related deals, generated AED132 billion (US$35.9 billion), according to data released this week from the Dubai Land Department. The emirate also recorded a 26% increase in total transactions compared to the first half of last year, rising to 35,571. Local economic conditions have squeezed Dubai’s real estate market in recent years, as plummeting oil prices put a strain on the purse strings of the region’s wealthy. The biggest neighborhoods for real estate activity by dirhams spent were the posh, man-made island Palm Jumeirah, which generated AED9.5 billion (US$2.6 billion), the downtown Business Bay, which generated AED6.5billion (US$1.8 billion), and the iconic Burj Khalifa and Dubai Marina neighborhoods, which generated AED5.8 billion (US$1.6 billion) each. The new data from the Land Department underscored what local industry experts have said over the past few months: That the market is beginning to turn around. “Despite global economic pressures, Dubai has once again reaffirmed its leadership of regional markets and driven renewed growth in the region,” said Sultan Butti bin Mejren, director general of the Dubai Land Department. “Our report for the first half of this year bears promising results for professionals in the real estate sector,” he said. 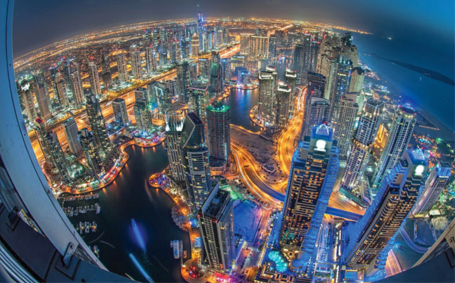 Dubai, an emirate of about 2.8 million people, has a population comprised mostly of foreign nationals. Local Emiratis make up less than a fourth of its residents. Still, local Emiratis drove the real estate sector, accounting for the largest share of transactions totaling AED15 billion (US$4.1 billion) in the first half of the year. Saudi nationals were the second largest contributors to the real estate sector, spending roughly AED4 billion (US$1.1 billion) in Dubai. Foreign investors spent 34% more this year than in the first six months of 2016. Most foreign investment came from Indian, Pakistani, British, Chinese and Canadian nationals, who together generated a total of AED28.6 billion (US$7.8 billion).